From 1960’s fashion to 2010’s models, Chris Moor truly has seen it all when it comes to fashion. Being a much admired figure in the industry and being at the forefront of fashion for 6 decades, his photographs highlight the dramatic evolution of the fashion world and the catwalk itself. On stage and backstage, his photography highlights the real trends of the decades, from the first ever catwalks up until now – the digital revolution, and it is great to finally be able to view his outstanding work at the Bowes Museum. The quality of his shots and his work are absolutely amazing, and it is great to see how the fashion world has changed from the 60’s all the way up until some of his latest shots in 2017, especially for them big names in the fashion industry such as Gucci, Channel, Versace or Paco Rabanne to name a few! 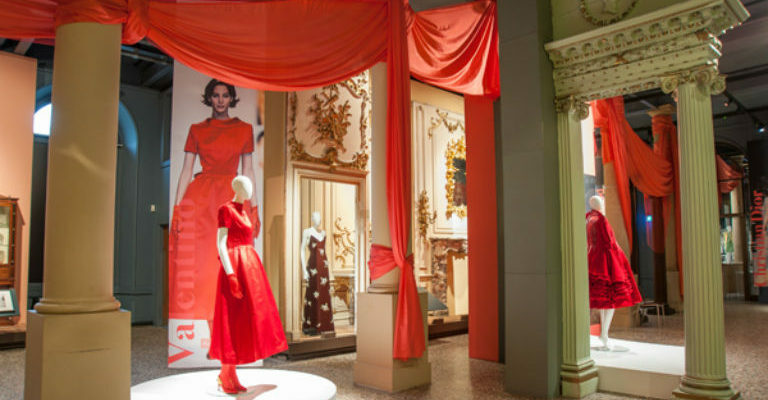 The Bowes Museum clearly displays Chris’s adventure with fashion, showing the work from each decade separately. His collection starts with his work from the 60’s – The Early Years – before going into his work from the 70’s – also known as the Birth of the Catwalk – where shots focused on the way the fashion is portrayed for some of the big brands such as Christian Dior or YSL for example. The 80’s – also known as the Four City Circus – includes shots from Giorgio Armani or Vivien Westwood’s collection, to name a few, whereas the 90’s explored a bust of colour – the decade of Super Models and Super Shows – this collection included some of the best pieces seen on the catwalk by Chanel or Versace, one of my favourites being the pop-art Marilyn Monroe dress by Versace. From there, the museum shows how Chris Moor experienced the Millennium Bug – the 2000’s – and the Digital Revolution Decades – the 2010’s – which saw Alexandra McQueen, Stella MacCartney or Marc Jacobs Spring/ Summer or Autumn/Winter range’s being modelled on the Catwalks of Milan. As well as this, the Bowes Museum have the fantastic outfits on display alongside the vividly illustrated photographs. It is fascinating to see the actual costumes and original outfits which appear in Moor’s work being on display for this exhibition, which have been generously lent out by some of the big fashion houses in appreciation of Chris’s talents. Many of the outfits are uniquely displayed on the artistic paper catwalk, which looks fantastic, it is so creative yet still allows the costumes to stand out. This room especially is a must see for all visitors. The Bowes Museum not only displays some of Moor’s best shots, but also tells the story of his life as well as revealing some of the biggest career highlights for him, one of which was his first invitation to photograph Chanel’s new range in Paris. It is fascinating to see how the photographer from Newcastle became not only a photographer’s assistant at the Vogue Studios in London, aged only 20, but, by the age of 21, had also founded a company in his own name taking photographs before going onto work in some of the most major fashion destinations in the world: London, Milan, New York and of course, Paris. This exhibition is one I’ve never seen before, however it is only at the museum until the 6th January, so make sure to make a visit soon. Head over to www.thebowesmuseum.org.uk to find out more.